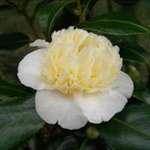 Not a true yellow camellia, but rather a white, anemone-form flower in which the central, cream-coloured petaloids give the flower an overall yellowish hue. The flower is virtually indistinguishable from C.japonica 'Brushfield's Yellow'. Moderately vigorous, dense, upright growth, forming a compact, bushy plant. Flowers March/April. Light to mid-green leaves. A very popular variety, often grown as a container plant. Delivery service excellent. Arrived well packaged and plant looks v healthy. Healthy plant well protected by good packaging. Process from order to delivery easy and quick.